I’ve wanted to attend the Miami Beach Art Basel festival for the past couple years, and this year I finally did it. I flew out from Chicago just in time – after a couple days of unseasonably warm temperatures, a deep freeze was hitting. But I sure as hell wasn’t taking a puffy coat to Miami. So you can imagine my mom’s commentary when she saw me dressed in my bright and colorful Rachel Roy spring jacket in December. In my defense, I was only taking a carry-on, and I needed a coat I could also use in Miami (and room to pack three pairs of wedges). The flight to Miami was on a tiny plane with only four seats across. That meant no room in the small overhead bins for even moderately-sized carry on luggage. That didn’t stop the lady sitting next to me from shoving her LUGGAGE under her seat. Yes, her roller carry-on luggage. Under the seat in front of her. I gotta say, I’ve never seen that before. Needless to say, the woman was all up in my personal space the entire flight. Rude. Luckily, the weather in Miami was amazing from the moment I landed to the moment I left. 80+ degrees daily and sunny. And this was amidst reports of unusually-cold weather in literally every other area of the U.S. I didn’t even need to wear my spring coat at night. My tiny Ford Focus. Who knew, manual windows still existed? Upon arrival, I headed towards Fox Car Rental. Luckily, I read the fine print on my reservation and knew I had to take the shuttle to the car rental port and then look for another shuttle to take me to Fox’s lot off the airport grounds. I was a bit nervous when I saw the sign for Fox painted on a panel of wood nailed to a tree, but my experience with them was completely positive. The price was right (literally the best deal for a car rental I’ve ever found), the lot was really only a few minutes from the airport, and picking up/dropping off went smoothly. 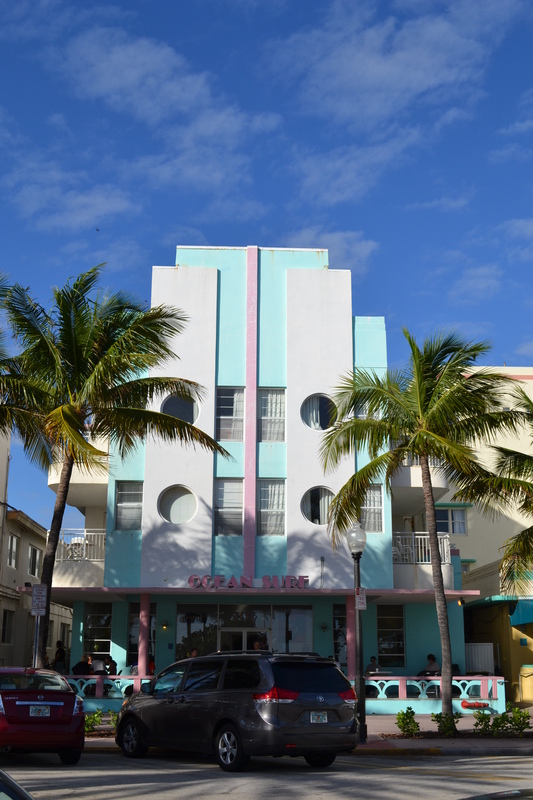 I drove to my hotel, heading north, north, north to the Art Deco-inspired beach-side Ocean Surf hotel. I wasn’t expecting luxury, but when I got to my room my heart sank a little. It’s by no means the worst place I’ve stayed in, but there may have been a few tears. In my defense, I was also tired, hungry, and lonely that I was going to be alone in this hotel, way up north on a strip of concrete along the beach that seemed pretty empty upon first impression. Ultimately, the Ocean Surf hotel ended up working out perfectly fine for me. The hotel wasn’t in the best condition, and the daily free breakfast of toast and cereal was as basic as you could get. But the hotel truly was right on the beach, and that little strip of Ocean Terrace Drive actually ended up getting pretty lively, so it wasn’t as deserted as I feared it’d be. And while Collins Avenue between 73rd and 75th had quite its fair share of shady characters, just one block south began a row of cafes and restaurants that were really nice. There were even a couple of perfectly pleasant restaurants on the corners of 73rd and 74th. Plus, parking was a breeze. There were plenty of spots right outside the hotel, and the meters were free from 6pm – 8am. Even when I did have to pay the meters, it was only $1/hour, which is chump change compared to Chicago. And while I was a little fearful for my personal safety when I first checked in, the girls at the front counter were very re-assuring and in the coming days I’d see that all types of tourists were staying there. Lastly, the hotel had cable. 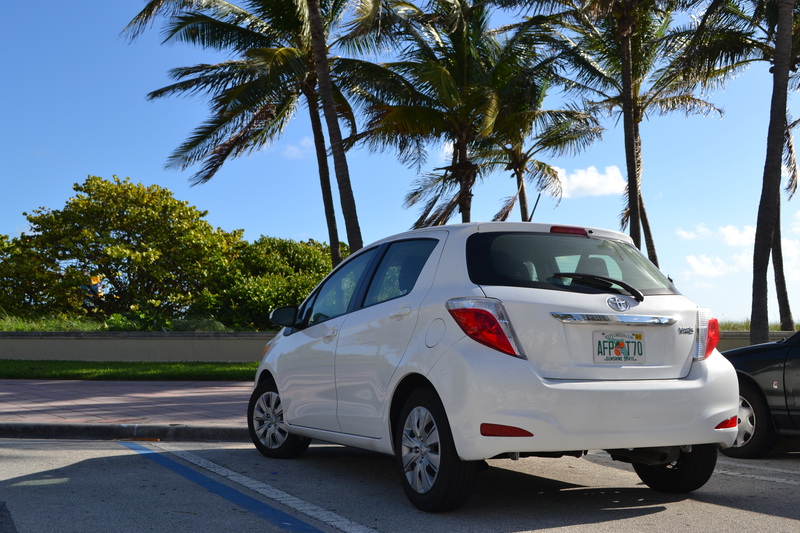 In conclusion, if you’re on a budget and have rented a car, Ocean Surf hotel is an affordable option for your Miami Beach stay. So I finally pulled myself together and walked a couple of blocks to eat at Fifi’s, a seafood place that had gotten good reviews on Foursquare. Food and wine always makes everything better. Fifi’s fried fish plate and tostones didn’t disappoint. And I became quite the pro at eating alone. After eating, I put on one of my three pairs of platform wedges and walked to the NADA Show (New Art Dealers Association). It was free AND within walking distance from my hotel at the Deauville Hotel. Plus, I really appreciate NADA’s mission of making contemporary art more accessible to the general public. Thank you, NADA, for catering to the budgets of broke art aficionados such as myself. 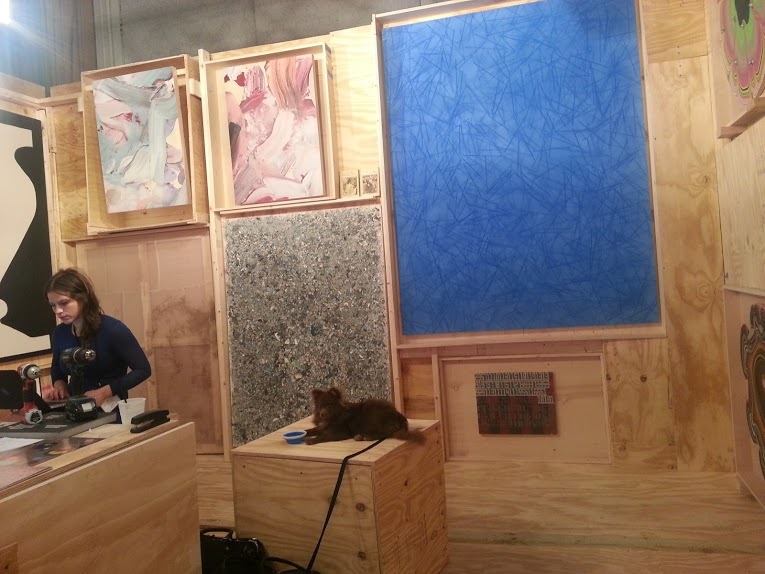 Nicelle Beauchene Gallery – this booth had some cool paintings, and when I checked out the website, I also came across artist Valerie Hegarty who does these explosive works of art and has even gotten coverage on Complex. Dan Miller at Creative Growth Gallery. An artist with autism, his works that feature letters and words drawn over and over each other were interesting. “Andy as the Odalisque” by Taylor Mead was featured at the Churner and Churner booth, and after making note of it, I noticed a lot of other sites including it in their round-ups as well. The paintings of Emanuel Seitz featured the most amazing bold, almost glowing, colors. Photos really don’t do them justice. Night Gallery featured this really cool waxy-looking sculpture that seemed to be a cat with some bunny features mixed into it, but after searching the internet for 30 minutes I couldn’t confirm who the artist is. If you know, leave a comment! The Hole had the coolest exhibition space, with the floor and walls all made up of wooden crates. Plus, the most adorable, well-behaved fluffy brown dog lounging on one of the crates. There were so many other cool things to see at NADA, but being my first fair in Miami, I didn’t quite have my note-taking/photo strategy down just yet. However, you can browse the fair online at Artsy.net.